Home Ancient History Ancient Greece Why did Sparta lose power over time ? Why did Sparta lose power over time ? 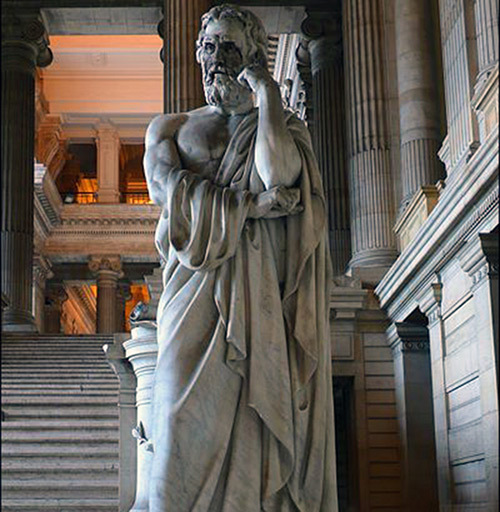 Lycurgus statue in the Brussels courthouse. Since the Dorian invasions of Greece in the 10th century BC and the law giving of the possibly mythical Lycurgus, Sparta had been the dominant military force in all of Greece. From the years after the Messenian War and the revolution of the Spartan army, her hoplites were unmatched with regard to discipline, strength and courage. 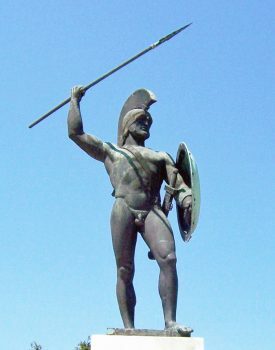 All of these combined to create a myth of invincibility on the battlefield and with victories over the Argives at Sepeia in 494BC, over the Persians at Plataea in 479BC and the defeat of the Athenian led coalition at Mantinea in 418BC, many opponents of Sparta were already defeated even before they took the field of battle. When the Peloponnesian War had ground to a stalemate, the Spartans had shown their ability to adapt when they incorporated a large navy into their forces to help defeat the Athenian Empire and create a new Spartan Hegemony. Sparta originally starting to lose hegemony in 394BC after the naval victory of the combined Persian and Greek fleet under the command of the Athenian general Conon and the satrap Pharnabazus over the Spartan navy led by Pisander off the coast of Cnidos. This defeat of Spartan navy was followed by the expulsion of the Spartan harmosts (military governor) throughout the Aegean and the virtual dissolution of the Lacedaemonian maritime empire. After eight years of intermittent warfare, Sparta was able to regain supremacy in the name of the Kings Peace laid down by Artaxerxes in 386BC. Sparta was able to dismantle the Boeotian and Chalcidian Leagues and was responsible for the dioikismos of Mantinea. 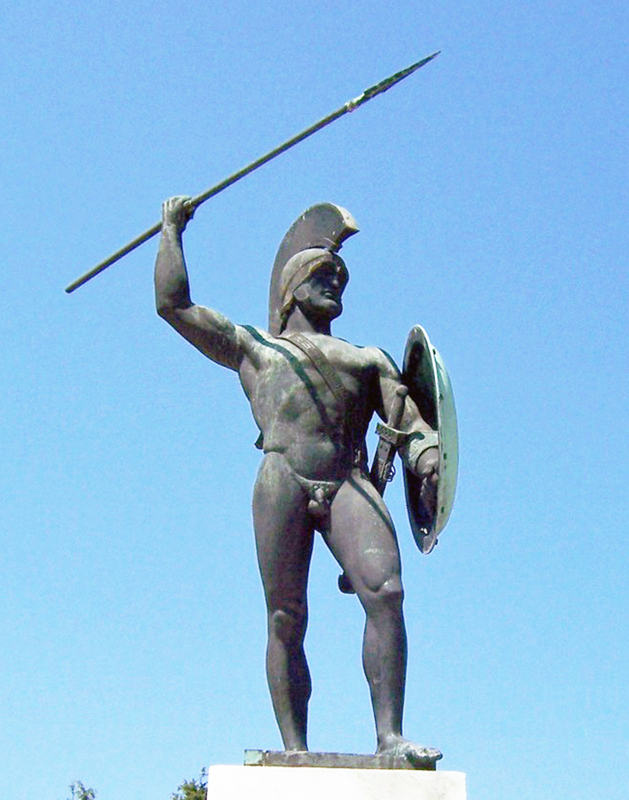 The Spartans even captured and controlled the Greek city of Thebes between 382BC and 379BC. However, after the ejection of the Spartan garrison from the Cadmea, the Attic invasion of Sphodrias and the subsequent alliance between Athens and Thebes, Sparta begins her final decline. The battles of Tegyra (375 BC) and especially Leuctra (371) put paid to any hope that the Lacedaemonians could once again retake control of Greece and indeed signified their fall into irrelevance and obscurity. The reasons for the Spartan fall from grace can be mostly traced to their failure to adapt the absurdly rigid Lycurgan system for a pan-Hellenic empire or for the influx of wealth that came with it. The councils, the “ephors” and the royal families of Sparta believed that the system given to them by Lycurgus did not need altering and they could cite the example of King Pausanias for the reasons why a Spartan should not have too much wealth or personal power. However, if they did realize that their system was too restrictive in an age of expansion, it was already too late. One of the major problems with the closed society, championed by Lycurgus and many other Spartans throughout the citys history, was the lack of fresh blood being introduced into the Spartan race. They had been inter-breeding since the Dorian invasions and a closed society such as this would eventually decline. This decline can be shown with the differing numbers of troops that Sparta could call upon to send to battle during the 5th and early 4th centuries BC. The most famous 5th century battle, which included Spartans, took place in 480BC at Thermopylae against the Persians. This is the battle in which three hundred Spartans and 1,000 allies under the leadership of King Leonidas held off the massive invasion force of the Persian King, Xerxes, which perhaps numbered over 120,000 men. This Spartan army was only a token force and, according to Herodotus, there were possibly 8,000 Spartiates available for deployment. This figure would seem to be corroborated a year later in 479BC when the Spartans sent 5,000 hoplites to lead the Pan-Hellenic army at the battle of Plataea. Knowing the Spartan apprehension over leaving their territory unguarded. Probably as many as 2,700 Spartiates were left in Laconia. Comparing these numbers with those that are reported for the 4th century BC, it can be large drop. After the Peloponnesian War in 404BC the number of available hoplites may have fallen to between 3.000 and 4.000. After the Battle of Leuctra in 371BC number of Spartiates also decreased. Another long-term cause for the defeats suffered by Sparta in the 370BC BC which was contributed to by the rigidity of the Lycurgan system, was the failure of Spartan generals and kings to adapt and change the tactics used by the Spartan armies. Even before the battles of Tegyra and Leuctra, there had been several instances that showed the Spartans to be tactically naive. The outmaneuvering of Spartan armies in Peloponnesian war by the Athenians at Olpae in 426BC and even more spectacularly at on the promontory of Sphacteria off the coast of Pylos a year later showed that the Spartans could be outwitted on the field of battle; and at the Battle of Haliartos in 395BC when the Spartans tried to implement a complicated pincer movement to trap the Thebans they ended up failing miserably and losing one of their only major tactician, Lysander. All of this illustrates that if the Spartans could not out-muscle or depend on their reputation to scare off their opponents, they were in trouble especially if the enemy had a competent leader. This is what happened at Leuctra in 371BC when a Spartan army met an undermanned Theban force. The Thebans were brimming with confidence after their victory at Tegyra four years earlier and were led by the seasoned campaigners Pelopidas and Epaminondas, while the Spartans were under the command of the young and inexperienced King Cleombrotos. It is debatable whether or not even the wily veteran Agesilaus would have been able to counter the deep ranks tactic of the Thebans especially when the Sacred Band was a match for the Spartan hoplites. Before the 4th century BC only the Spartans could boast a standing, professional army but in the years following the Peloponnesian War there was a dramatic increase in the demand for mercenaries, especially Greek hoplites and peltasts. Many Greek citizens no longer wanted to fight for their land if it was going to be destroyed while they were away. The governments themselves had also realized that the citizen militias they called upon to fight for them were not as capable as professionals. Thebes was the first major power to follow Sparta’s example and form a military unit of three hundred highly-trained full-time soldiers in 378BC called the Sacred Band, which was led first by its founder Gorgidas and later by the great Theban general, Pelopidas. Other Greek cities, instead of training their own unit, would hire mercenaries, which by the 4th century came with their own equipment and sometimes a capable leader. There had been mercenary armies for centuries, shown with the inscription of the names of Greek mercenaries, who had been hired by the Egyptian King Psammetichus II between the years 594BC and 589BC, on the statues of a temple in the city of Abu Simbel in Upper Egypt, but only now in the 4th century BC did they become increasingly important. Many other famous Greeks found employment as mercenary leaders in the 4th century BC either through want or necessity. Athenians like Conon, his son Timotheus and Iphicrates are known to have sold their services to the Persians but most famously in the last years of his career, while still King of Sparta, the nonagenarian Agesilaus led two mercenary armies in Egypt in an attempt to gain much needed funds for the Spartan treasury right up until his death in at the Harbour of Menelaus in the winter of 361-0BC. The growing usage of mercenary and professional armies in Greece took away the main advantage that Sparta had held over her subordinates for nearly three centuries and once this happened, as was to be expected, the Spartans were unable to cope with this reversal in fortunes. There is another reason that several ancient sources give for the sudden downfall of the Spartan hegemony and that is religion. It was widely believed in Greece that the gods, being spiteful deities, brought down the great powers before they got too great with a proverbial Hand of God, a notion expressed by Jason, the despot of Pherae. The first major action that Spartans could have taken in order to improve system would have been to change the isolationist nature of the Lycurgan system and join the rest of the Greek world in the age of expansion in the years following the defeat of Persians at Plataea in 479BC. This may also have helped Sparta to overcome shortage of hoplites as the religious devotion to the Lycurgan system restricted Sparta from elevating more people and classes to eligibility for full-time military service, as the Athenians had done and as Rome would do to great effect some 200 years later. If they had undertaken these actions the Spartiate’s population might not have plummeted as drastically as it did and Sparta may well have been better suited to running and controlling the maritime empire that she inherited after defeating Athens in the Peloponnesian War. Another major innovation that could have been established in Sparta is the use of a proper currency instead of iron bars. An evolved system based on Lycurgan-like ideas along with a worthwhile coinage could have helped Sparta survive the dilemma of the Theban invasions of the Peloponnese in the years after 370BC by enabling them to hire a larger army of mercenaries than they did to defend their city. This may also have helped the Spartans regain their place as leader of Greece when Thebes. Greece with a reinvigorated Sparta at its head would well have been able to put up a better fight against the Macedonians than the power vacuum that awaited Philip in the 340BC.